FILE - Burundi's President Pierre Nkurunziza speaks at the start of a campaign for a May 17 referendum on constitutional change. It could enable the president to retain power for another 16 years. Burundians gathered in churches Sunday to pray for peace as the country prepares for a controversial referendum Thursday that could extend the president's term in office by as much as 16 years. The Catholic Church has said it will fight to protect the country's democratic gains after its request to postpone referendum vote was denied. Leonard Nijimbere is among hundreds of Burundians who attended a Sunday church service. “Today in the church, we were taught how to love and live with other people in harmony,” the 28-year-old Catholic said. According to multiple churchgoers, no politics was discussed in the church that is in the center of this capital city. The Catholic Church has come out against President Pierre Nkurunziza government's plan to change the constitution. The head of the Conference Catholic Bishops of Burundi, Joachim Ntahondereye, said the conference would fight to protect democracy. Some of the issues Burundians will consider in the referendum vote will be whether to allow the president to seek re-election twice more. That would keep him in office until 2034. 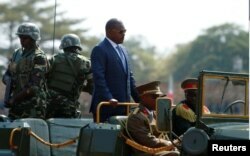 FILE - Burundi's President Pierre Nkurunziza arrives for an independence day celebration in Bujumbura, July 1, 2017. Nijimbire lives in the opposition neighborhood, which has been campaigning against the constitutional changes. “I will vote despite fear for my well-being. When I walk in the street and they ask whether I voted I will show them that I have voted but I don’t like to vote,” he said.